Steve Rice (Olympia, United States) on 12 November 2018 in Cityscape & Urban and Portfolio. Très très belle photo tant dans le minimalisme que dans les couleurs d'automne en reflet. Oh yes, good joke betwen the colors !!!! This beautiful autumn photo echoes my series yesterday, it's beautiful! Beautiful colored reflections and composition ! The colours are very beautiful and soft! Superb reflections! A perfection . . in every way. De magnifiques reflets ... Beauté de l'automne. une magnifique composition, belle palette de teintes d'automne. wow...the colours in the water are mesmeric !! Magnifique !! Une photo de rêve !! Love the autumnal colours reflected on the water. superbe miroir, grand espace !! Splendid autumnal colors reflected in the water! The thumbnail of this already had me nodding and smiling, and then my screen filled with colour and beauty. A stupendous Autumn composition. Splendid composition , colors and light . Wonderful compositon and gorgeous colors. Delightful colours ! A wonderful scene! This is a beautiful image! Just beautiful! Wonderful colourful reflections that have a mesmerising abstract effect. Great idea to include the duck. It anchors the image well and give a bit of context to the scene. 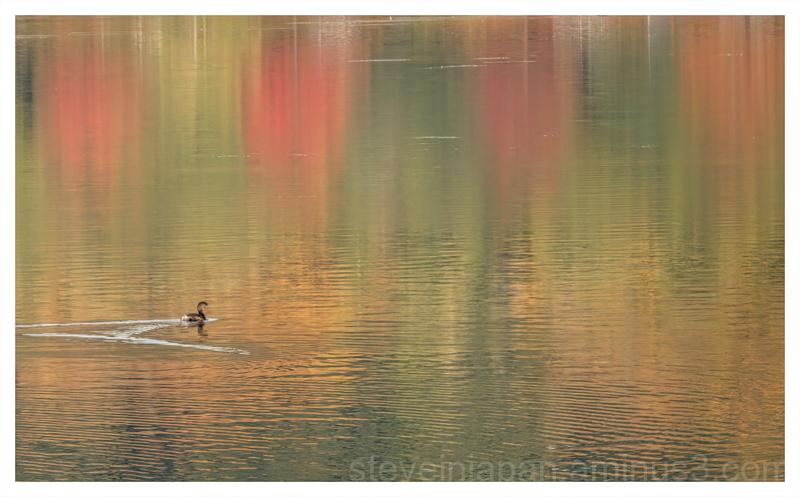 The colors of autumn reflecting in there just made this image all the more beautiful, Steve... Nicely captured! Wow, what a color palette reflected here!